Former England prop Matt Stevens has described his two-year ban for cocaine use as "the best thing that ever happened to me." 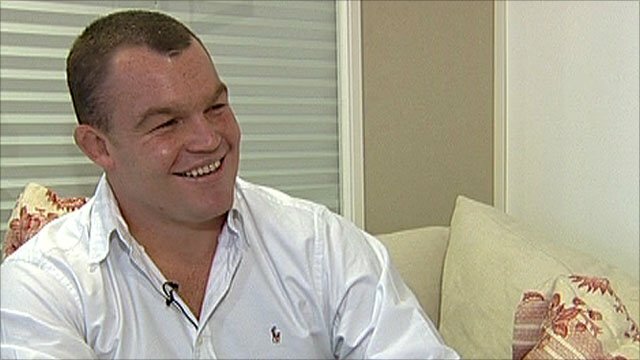 In an exclusive interview with the BBC ahead of his return to rugby on Wednesday, Stevens said he was in "a lot better place". The 28-year-old will resume his club career with Saracens. Stevens tested positive for cocaine following Bath's Heineken Cup game against Glasgow in December 2008. He was subsequently banned but told BBC Sport: "It's going to sound very odd but it's probably the best thing that ever happened to me. "That whole experience, getting banned, all led to where I am today and I'm genuinely a lot happier person and in a lot better place, so it's a good thing." Stevens admitted, though, he cannot afford to think he has conquered his problems. "That's what you learn about addiction and the issues surrounding it - it's not about conquering it, it's about keeping it in check, and I regularly see someone, I go to counselling. It's about being aware that it's a problem you've got to continually be on top of." Durban-born Stevens will attend his first training session with Saracens on Wednesday and said: "It feels like Christmas Day - I packed my bag last week. "I'm pretty nervous. It's amazing I'll be able to play rugby again. "I'm a social animal and I really miss team training sessions. That sounds bizarre because when you play you can think of nothing worse than training - you really want to play." Stevens admitted the last two years had been a "rollercoaster ride" and a "humbling process", but he has kept himself fit by doing Brazilian ju-jitsu - a form of submission wrestling - and explained: "With the mindset I've got now I can only be in a better place to be a better player." Many were surprised by his decision to quit Bath, but he said: "As an individual I really think the fresh start is something that I needed. "Take nothing away from my time at Bath. I had a brilliant time and it's such a special place to play. But it was time to move on and Saracens is a really good place for me to do that." Stevens insisted he would concentrate on his club career before thinking about England, for whom he won the last of his 32 England caps against New Zealand in November 2008. During the course of his ban he has seen younger props like Leicester's Dan Cole and Bath's David Wilson come through to establish themselves in the England squad and he was cautious about his international future. "It is my goal to play for England again but I've been out for two years and I wouldn't ever to want to come across as that guy who would assume he's got what it takes to play," he said. "I've got to concentrate on playing well for Sarries and if that takes me to a point where I can play for England, that's brilliant."